Hooray! A last-minute finish for Friday! My LOVE mini quilt is finished & hanging on our wall. I finished sewing the binding on tonight while watching an episode of Call the Midwife, then got it up on the wall right after that! I really debated about the binding. White was not my first thought - I was leaning toward a navy or grey print. But after auditioning a few, nothing struck me. And the walls of our room are a blue-grey, and the fabrics that I sort of liked for the quilt seemed to clash with the walls. So, white it is, and I'm hoping I don't regret it. I followed the suggestion of the tutorial on Sew Mama Sew and hand quilted 1/4" from all of the letters, but I just used white perle cotton instead of a color to match each letter. It adds just a little texture. Other than deliberating for a while over the binding fabric, this was a quick, fun project! I think we'll enjoy this new addition to our walls. Happy Friday! Linking up to crazy mom quilts and My Quilt Infatuation. The one exception is that the book in the middle, Home by Marilynne Robinson, is a recently completed book that I just couldn't leave out of this post. I had read a different book by Marilynne Robinson a few years ago and was not particularly fond of it, so I had stayed away from her other novels until this fall, when a friend gave me Home. I'm SO glad she did - this book just gripped me and made me feel like I really knew the characters. It doesn't feel like fiction - Robinson has such a rich understanding of people and relationships that this just feels real. It's not a particularly quick read - I needed to savor it. Lila is Robinson's newest novel, about a character who is also in Home. Also a very rich novel. I'm fairly close to finishing this one, and it's what I'm picking up most nights before bed. Loving the Little Years: Motherhood in the Trenches is the book I'm picking up every now & then when I'm looking for some encouragement as a mom of 2 little ones. The short chapters are perfect for a quick dose of perspective. I'd like to make it through this one all the way. It has come highly recommended from several friends, and I'm definitely enjoying it. Alan Bradley's Flavia de Luce mysteries are pretty popular right now. I read the second book, The Weed that Strings the Hangman's Bag, this summer, and am ready to enjoy more of the precocious 11-year-old detective's adventures. Bradley's books are definitely quirky, and it took me a little while to really enjoy the first book I read. The characters are all extreme - a far cry from Robinson's characters. But, my husband and I occasionally enjoy reading a book together out loud, and this is our pick for that. We haven't made it terribly far, though, as we're both reading other books at the moment. The bottom "book" in my stack is actually my Kindle. And my current Kindle read is Found: A Story of Questions, Grace & Everyday Prayer by Micha Boyett. This book came highly recommended to me by a friend who has a daughter close in age to my son. Her description of this book captured my attention - as a busy mother of little ones, prayer often takes a backseat. The author's journey to renew her prayer life is something that I desire, as well, and I'm really looking forward to diving deeper into this book. Bonus book: I've also recently begun Whose Body? by Dorothy Sayers on audiobook. I love listening to audiobooks while I'm doing dishes, folding laundry, and sewing! I have yet to read a Sayers novel, but she is recognized as an excellent British novelist known for her Lord Peter Wimsey detective novels. This particular one does not have quite as high of reviews as some of her other Lord Peter Wimsey mysteries, but it was available from the library when I was looking! Whew, I think this is enough to keep me busy for a while! Happy reading! I love hearing what other people are reading and am always looking for a new book recommendation, so feel free to leave a note in the comments! Since it's February, I wanted to share my current favorite WIP - a LOVE mini quilt. I have been eyeing this little mini quilt from Sew Mama Sew for quite some time. It's a simple paper-pieced pattern, but is quite fun to put together! It definitely has a Valentine's Day feel to it (and could be even more so with different colors), but I'm hoping it will have a permanent home on one of my bedroom walls. Our master bedroom could use a little sprucing up. I'm trying to keep it a secret from my husband, so progress is a little slow. (I really like surprises, both giving & receiving them!) The plan is to start the quilting tomorrow and hopefully have it finished by Friday. So... check back on Friday to see the finished quilt! For some more love-themed quilty fun, check out Sew Cute Tuesday over at Blossom Heart Quilts. I'm also linking up at Lily's Quilts for her Fresh Sewing Day & Small Blog Meet. If you're visiting from one of those sites, thanks for stopping by! And if you enjoy book recommendations, check back tomorrow to see what I've been reading this year. I'm excited to be participating in my first quilting bee - The Bee Hive! 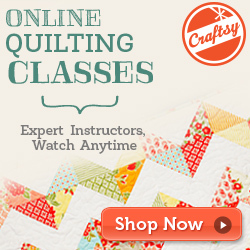 This lovely virtual quilting bee is hosted by Blossom Heart Quilts and Gnome Angel. I'm part of swarm 21 and am so looking forward to getting to know my bee-mates this year! The Bee Hive is a year long bee, where each month everyone in the swarm makes 1 block for the "queen bee" of the month. The queen bee gets to select her block and colors, and then ends up with 12 coordinating blocks to make a quilt. Right now it's looking like I'll be queen bee in November, so I have lots of time to think about my quilt. In the meantime, though, I can't wait to get started making blocks for all the ladies in my swarm! I'll be sharing updates on bee blocks throughout the year. One other really fun part of all this - my mom & I are in the same swarm! I love that we get to do this together even though we live a couple of states apart. I hope you had a wonderful Christmas & a great start to 2015! It seems like every year things slow down enough at the beginning of the year that I'm able to find time to blog. My mom has a tradition of making quilts for all of her grandbabies. Mom has given each of my two kids a quilt for their first Christmas. These are so special to me - I know all of the love that goes into making them! Here's Anna opening her quilt, with a little help from me. BeBe & PopPop are looking on. Maybe she'll be a future quilter? :) Mom asked me to help pick the fabrics & pattern for this quilt, so that was really fun! It's based off the Little Wheels quilt from Blue Elephant Stitches. Mom made her quilt a good bit larger than a baby quilt so that she'll be able to use it for a while. Also, I'm realizing now I don't have a picture of the quilt by itself. Thanks, Mom, for such a special quilt for Anna!